In May 2000 while on holiday in Cornwall we touched a high kerb in a narrow street while reversing. Speed was about 5mph, so I was horrified to see the result on the front nearside wheel. About eight inches of wheel rim chewed and a split in the side wall of the nearly new tyre. I said "Oh dear." at the time - at least I think it was something like that. So a new wheel was purchased and a new tyre fitted. 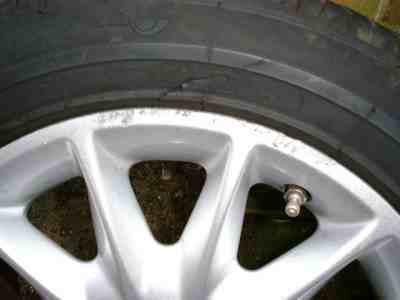 In November 2000 during the MOT the eagle-eyed inspector noticed a flattened inner wheel rim on the rear off side. We had already replaced one flattened wheel, and now we had another! Fortunately the tyre wasn't damaged. The garage man mentioned a wheel refurbishment company nearby and I remembered the kerbed wheel tucked away in the garage, so I dropped it in to the garage so the refurb guys could pick it up. I placed the r/o/s tyre onto the refurbished wheel and put that on the car, and I will see if the refurbishment people can restore the true to the flattened wheel. They quote £28 per wheel - and that must be better than £116! The one below is the now reburbished wheel in place on the rear o/s. Now like new at a fifth of the price of a new one. 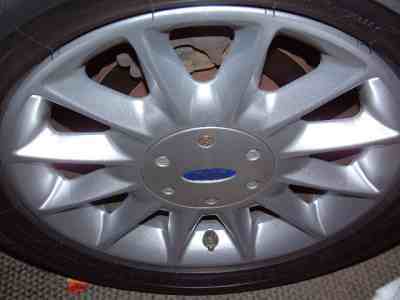 Next will be the wheel with the flattened rim!